American DJ Fusion FX Bar 3 White light effect. Unit features 3 strobing (variable speed) chasing or steady burn white LED pixel pods and 4 LED pinspot type effects (which also strobe, chase or steady burn) in one chassis. Fusion FX Bar 3 Very unique effect ultra bright and when strobing the use of the led pinspots give the depth and deep impact accentuating the led pixels wider angle strobe. Great for house parties, nightclubs, lounges, bands and mobile DJ's. Three operating modes. Linkable master slave via XLR or DMX cable. 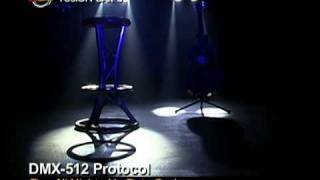 Can be run using the UC3 remote or DMX 512 control functions turn on/off specific effects. Stand alone operation sound active. Considering purchasing the American DJ Fusion FX Bar 3? Have questions? Ask people who've recently bought one. Do you own the American DJ Fusion FX Bar 3? Why not write a review based on your experience with it. 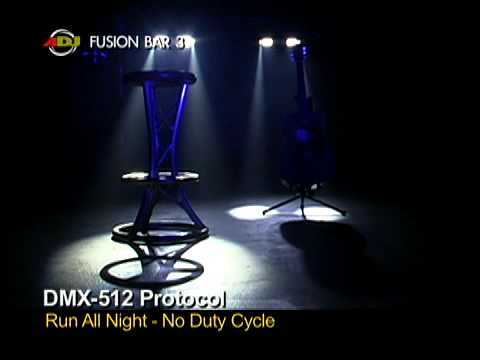 Seen a video for American DJ Fusion FX Bar 3 online or have you own video? Check out American DJ Fusion FX Bar 3 on DJkit.com!